Into the Spider-Verse is Sony’s first feature-length animated Spider-Man film, and it’s the first time we’ll see Marvel’s Miles Morales on the big screen. Though it could appear on the surface to have no connections to the live-action films, there’s a very real possibility the movie could establish some major connections between all of Sony’s Spider-Man flicks going back to the Tobey Maguire era. Most Spider-Man fans know that Miles Morales, Peter Parker, and Gwen Stacy became superheroes after being granted superpowers thanks to bites from radioactive spiders. 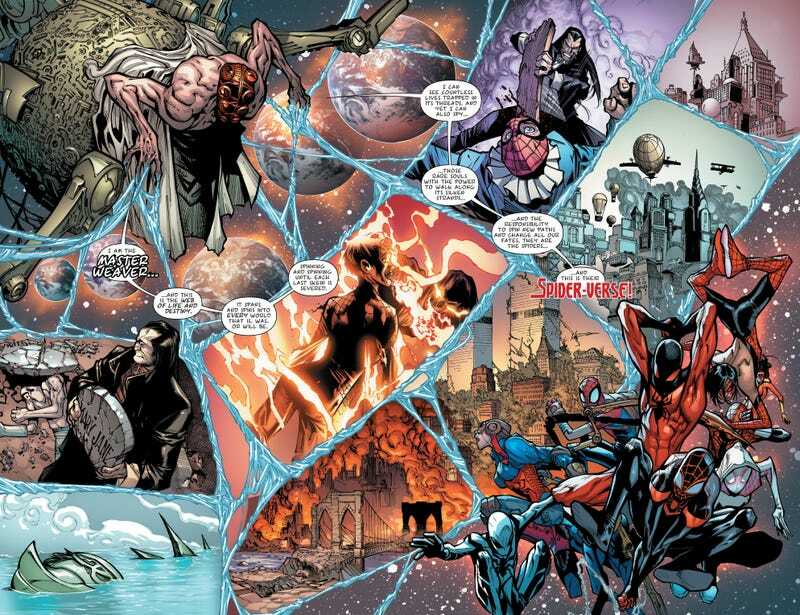 But the characters are also part of a much larger, multiverse-spanning destiny that was fleshed out in 2014's “Spider-Verse” event. While every webhead’s exact backstory is somewhat different, “Spider-Verse” explored the concept of all spider-themed heroes from every possible universe being chosen by an interdimensional being known as the Master Weaver. Under normal circumstances, these spider “totems” were fated to help shape and protect the web of life and destiny, but when the villain Morlun begins travelling from universe to universe to murder them, the totems realise that they have to team up if there’s any hope of them surviving. 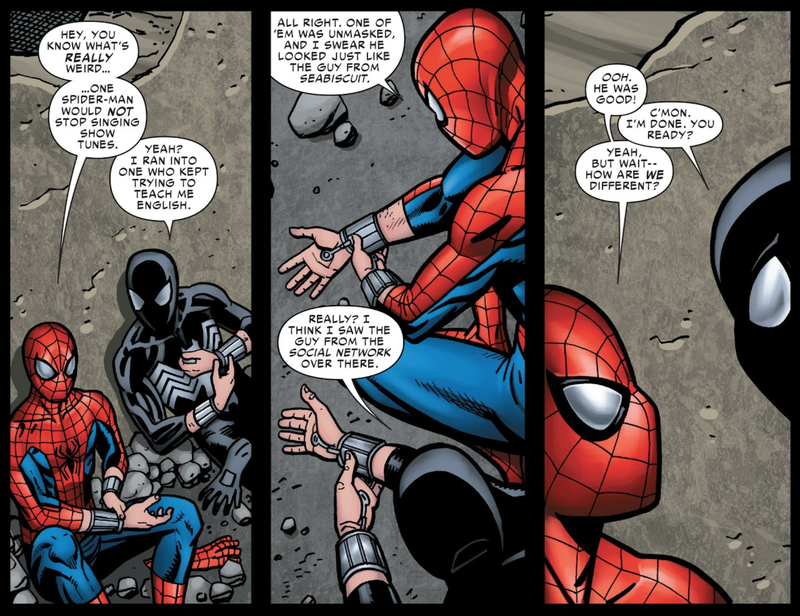 Since the “Spider-Verse” event, team-ups between totems from different universes have become rather common in Marvel’s comics and television shows like Disney XD’s Ultimate Spider-Man animated series. Funnily enough, Dan Slott’s story “It’s the Little Things” from Spider-Verse #2 explicitly acknowledges the existence of Sony’s previous Spider-Man films and the much maligned Spider-Man Turn Off the Dark musical. That’s what makes Into the Spider-Verse’s introduction of the conceit to the big screen so (potentially) significant. In the film, Miles explains that he’s learned about the multiverse and the existence of other spider heroes—like the older, more haggard version of Peter Parker who decides to mentor him. The Peter of Miles’ world is dead, meaning that Into the Spider-Verse’s Peter is either a clone (unlikely) or from an alternate dimension (more likely). It’s altogether unclear just where the movie’s version of Spider-Gwen is from, but considering how young she is and the fact that Spider-Gwen traditionally comes from a universe where Gwen Stacy is bitten by the radioactive spider instead of Peter, it stands to reason that she’s also from a world other than Miles’. Because Into the Spider-Verse is capitalising on the multiverse in such a big way, it gives Sony the ability to do something truly clever that might not immediately be obvious. The studio already had the makings of a multiverse, considering its previous three iterations of Peter Parker: the original Spider-Man trilogy, The Amazing Spider-Man duology, and Spider-Man: Homecoming. All that’s ever really been missing between the previous franchise is any sort of narrative tissue connecting them all, but that’s exactly what Into the Spider-Verse looks like. Into the Spider-Verse is Miles’ movie and it should focus primarily on his path to becoming a hero, but with its very existence, Sony has the chance to build a more expansive cinematic universe than either Marvel or Fox have created so far. The connections would be tenuous, and a nod to the other Spider-Man films could be as innocuous as a mention of Peter’s dancing in Spider-Man 3, but it’d be quite the hat trick if Sony managed to pull it off.